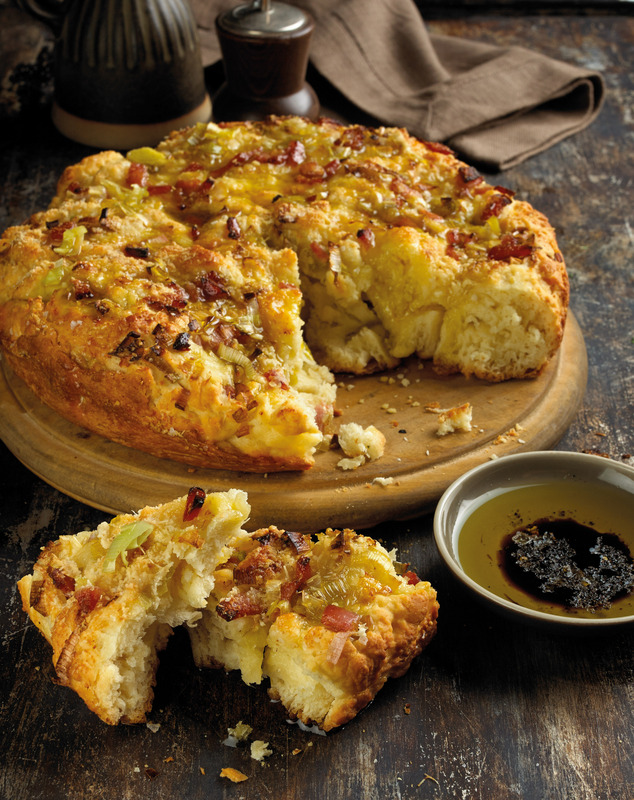 Focaccia Bread with Leeks | Flavor Your Life. Brush deep round cake pan with 2 tablespoons of extra virgin olive oil. Evenly sprinkle the sides and bottom of the pan with cornmeal. With the dough at room temperature, knead and roll into a circle. Place into the pan, stretching and pressing out to the edges, so that it covers the entire bottom of the pan. Cover with plastic wrap and leave to rest in a warm place for 30 minutes. In a small saucepan, heat the remaining extra virgin olive oil. Add the leeks and cook for 5 minutes until soft. Add the ham and continue to cook for an additional 2 minutes. Leave to cool slightly. Gently dimple the dough with your fingers, pressing the leek and ham mixture into the dough. Sprinkle with the salt and Parmesan cheese.